This book is well structured, well illustrated and well explained. And it is a very timely, very helpful, very useful book. Need exists in the age in which we live all over the world, particularly in India, to guide young men and women in the choice of their educational and professional patterns. That this is done best through astrology, Hindu Jyotish, is the one fact which will get established in the course of few more years. Where an educational psychologist begins to meander through many possibilities and with some hit or miss successes and failures, the astrologer is on a more certain ground. I have guided so many students in India particularly in Delhi in the choice of their educational options. So many have benefited. It was for this reason that I got produced a research by students and published it in the Journal of Astrology. But there is a constant need for updating these researches to be of immense use for the large number of students seeking proper careers in India where the percentage of literacy has grown enormously and we have the largest pool of technocrats in the world. •	Professional education leading to specific profession only like that of a doctor. Engineer, chartered accountant etc. •	Certified professions to enter which one has to have the prescribed educational qualification like that of a lawyer. But then there are many who have legal qualification but not practising as lawyers. •	Bureaucratic careers do not depend on any specific education patterns but on specified education qualifications to open the door to competitive examination like the Indian Administrative Service. •	And there are techno-bureaucratic profession in which a very specific qualification alone opens the opportunity to enter a service like of a member of the Indian engineering service. Col. Gour being aware of such complexities has neatly opened some lines of analysis which must lead a keen student on the further research. Such a good research of such rich composite nature as Col. Gour presents in this book gives you the lines along which future research should be done and should progress. It is my great privilege to write about Col. AK. Gour who is a senior faculty in Bhartiya Vidya Bhavan, teaching Astrology to large number of senior students as well as researchers since long. His method and abilities teach is phenomenally of a very high order. While he is proficient in all branches of Astrology, his special forte is Profession’ in which he excels. he is an able and a popular teacher with a great style of teaching as also giving accurate prediction with great analytical skill. He has derived his abillities not only from deep study, knowledge and sound judgement but also from his great faith in religion and higher values of life. Col Gour has done a great service to the student community by a—c a keen interest in not teaching astrology but in upliftment of their moral values by inculcating right behaviour and following prescribed religious traditions. This moral fiber and faith in Cod has helped him make him a great astrologer. There are very few like him who are totally cated to higher values that Astrology represents. What makes him still greater is the fact that inspite of his profound ability as a sound astrologer it kept himself aloof from following run of the mill method of taking financial advantage of it and making astrology commercial and cheap. 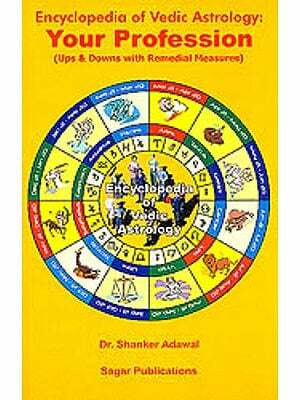 I am sure that this present book, ‘Astrology of Professions’ will be a valuable and masterly contribution to the subject and would be as popular and successful as his earlier books had been. Need exists in the age in which we live all over the world, particualy in India, to guide young men and women in the choice of their professional and professional patterns. That this is done best through astrology, Hindu jyotish, is the one ct which will get established in the course of few more years. When an educational psychologist begins to meander through many possibilities and ends with some hit or miss successes and failures, the rologer is on a more certain ground. I have guided so many students 7 India, particularly in Delhi in the choice of their educational options. So many have benefitted. It was for this reason that I got produced a research by students and published it in the Journal of Astrology. But there s a constant need for updating these researches to be of immense use for re large numbers of students seeking proper careers in India where the percentage of literacy has grown enormously and we have the largest pool of technocrats in the world. The emphasis having shifted from humanities to technical sub)ects, re astrologer must know the fine distinctions that exist between one technical profession and another. It is for this reason that I have been telling my students not to use the word ‘malefics’ which become technical planets and benefics’ which become non-technical planets. Then combined with rashis which are again technical and non-technical, the combination of planets influencing the house of education gives rich indication, many times very specifically, about the type of education one is likely to have. As many as twenty five students had presented their case studies on education in the convocation of October 2003. 1. Professional education leading to specific professions only like that of a doctor, engineer, chartered accountant etc. 2. Certified professions to enter which one has to have the prescribed educational qualification like that of a lawyer. But then there are many who have legal qualifications but not practising as Ia’ers. 3. Bureacratic careers do not depend on any specific education patterns but on specified educational qualifications to open the door to competetive examination like the Indian Administrative Service. 4. And there are techno-bureacratic professions in which a very specific qualification alone opens the opportunity to enter a service like of a member of the Indian Engineering Service. Col. Gour being aware of such complexities has neatly opened some lines of analysis which must lead a keen student on to further research. The book is well structured, well illustrated and well explained. And it is a very timely, very helpful, very useful book. As usual it once again establishes the fact that in producing world’s best researches in astrology, the Bharatiya Vidya Bhawan, Delhi, is the foremost in the world and unparalled and unequalled. And Col. Gour is the second seniormost member of the teaching faculty of the Institute of Astrology here. Varahmihir in his monumental creation the “Biihat lataka” has delineated Profession in four Shlokas in the Chapter called the “Karamjeevi Adhyaya. Time is a consumer of all the things, it changes and we, keeping with times, change with it. Today earning of a livelihood has become the focus of our existence. Profession takes the centre stage in astrological exposition. This book examines the Profession in the manner as laid out in the succeeding paragraphs. The commencement of any astrological exploration has, of necessity to be anchored to the classical texts. It of course needs to be modified in the light of changing times and in conformity with the information explosion that is sweeping the world of today. The opening chapter gleans t-e classical texts, collates the relevant data and presents it in an easily understandable form. This chapter also has the summary of the views on ns subject of Professions by the doyens of astrology like my mentor K. N. Rao, Shri Hardeo Sharma and Dr By. Raman. Relevant combinations t; modified to conform to the modern world round up this rather long t: important chapter. The book then tackles education; the womb where profession is conceived nurtured and delivered. Educational inclinations and their likely fructification if properly analysed, lead to a coherent and justifiable assessment of the most suitable profession(s). A person wishes to know whether he should seek his future in an environment of service or should he prepare for a living by self occupation. Astrological guidelines to sort out this dilemma are given and explained with the help of suitable examples. An easy to way to find out the time of the earning of the First Salary is then given. The periods of rise in the Profession and those that cause distress are tackled next. The astrological discussion is supported by examples. This is followed by an expose of the technique of analysing a horoscope for the purpose of determining the likely profession. The book then examines ten different professions. The Doctors, the Layers, the Engineers, the Bureaucrats, and the CAs are all here. The modern professions of the Television persons, the Fashion technologists. the Computer professionals along with the Hotel Management Executives and the Journos round up the ten professions. This book has had a very long gestation period. It would still have been resting in the womb of flrne had it not been for the persistent demands of the students. Air Commodore Chandan Ghosh not only spear’ headed the students demand but also actively participated in its preparation and finalisation. He is a computer wizard, has a razor sharp mind his constant prodding is instrumental in the finalisation of this book. Scores of people comprising my colleagues, the research students and those that interacted with me in the classes deserve the credit. Vishal Grover. Pretty and Avinash did the proof reading and (thank them. (also thank my Guru K.N. Rao for teaching astrology to me to the level where I art able to teach and to write, the book would have achieved its aim if it satisfies him.